African violets can grow happily in either artificial or natural light. What defines happy? Blooming regularly. Some varieties take a break of a month or three between bloom cycles, but if you haven't seen a bud in over four months, lighting may be an issue. African violets can flourish under bright artificial light. Artificial light set-ups can be as elaborate as commercial LED light-carts, or as simple as fluorescent shoplights hung from shelving. In either case, distance between lights and plants is crucial. If placed too far from the lights, plants will simply survive. Too close, and the foliage can burn, turning yellow or white. (Some12-15 inches between the top of the plant and fluorescent tubes promotes healthy growth and flowering. Some bulbs may be stronger, especially new ones, and might need greater distance. Some violet varieties require more light than others. Monitor your collection for signs of light stress. Increase exposure by boosting violets individually closer to the lights and/or changing placement to the middle of the fluorescent tubes. Decrease exposure by moving plants toward ends of the tubes where light is weaker. Some varieties will bloom happily a few inches past the ends of the tubes. Lights can be set on timers for best results. Allow at least 8 hours of darkness per day. Violets need their beauty sleep! 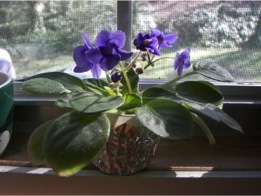 African violets can thrive and flower in natural, filtered sunlight from a south or east-facing window. Window sheers or outside plants can reduce the glare of full sun, even from a western exposure. Light from a north-facing window can be too dim, and plants may bloom sparsely or not at all. Test sunlight conditions with your hand. If the light feels warm on your hand or if your hand casts a distinct shadow, the light is probably too intense. Be certain to rotate plants every few weeks so they'll grow symmetrically. They'll remind you by angling toward the sunlight. This is not usually a sign of stress, but simply their reaction to a directional source of light.